Apple revealed many new plans and features in the keynote event for its Worldwide Developer Conference (WWDC) in San Francisco Monday, but one that's set off a flurry of interest among iPhone fans involves the iconic "slide-to-unlock" feature. Once the new mobile operating system iOS 10 debuts this fall, "slide-to-unlock" will be no more. Since it was first introduced, the feature has been an easy, elegant way to access the home screen on an iPhone. Now, with the new iOS, users will instead unlock with Touch ID and then tap the bottom of the screen where it says "Press Home to open." Why the change? In they keynote presentation, Apple VP of software engineering Craig Federighi demonstrated how swiping left and right will instead give users access to the camera app as well as other widgets. This is all part of what is designed to be a more seamless, interactive lock screen. 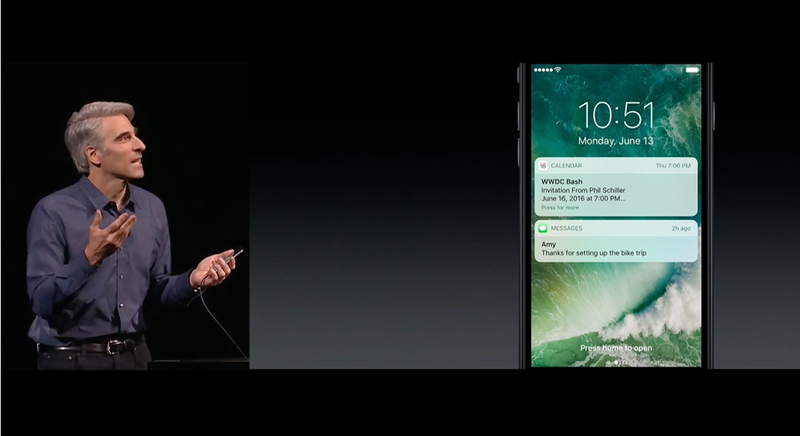 During the presentation, Federighi highlighted the "3D touch" feature of the lock screen, which enables users to access incoming messages and calendar notifications, for instance, without even having to unlock their phones. The absence of the familiar "slide-to-unlock" might take some getting used to for users. Some took to social media to express their opinions. As is typical any time there's a change to popular iPhone features, reactions have ranged from excitement to annoyance to disappointment. Keep in mind that the new operating system is available now only as a developer preview. The official version of iOS 10 will roll out to the public this fall. Complete coverage of WWDC 2016 on CNET.